We're still looking for a better way to explain the difference between PHP execution model vs Python for web application to new developers joining us. This is to help them understand the key differences when developing web application in Python. One source of confusion among them was when they realized the state-full nature of Python web application compared to state-less nature of PHP. The following diagram is my attempt to show them these key difference. PHP execution model is quite simple actually and follow a cgi-like model. It simply take the php file as it's input, parse and interpret it and then return what ever output the script produced, pass it back to apache as response that will return back to requesting user (browser). Unlike cgi, mod_php already preloaded with the PHP interpreter so the process of parsing and executing the script is fast since it does not need to invoke PHP interpreter for each requests. 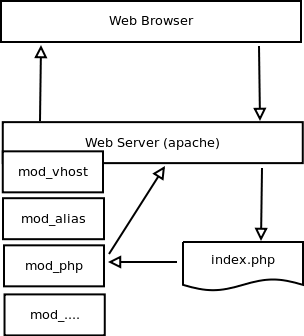 This diagram also tell us that mod_php is simply a fast PHP interpreter and it does not know anything about our application. This make PHP a state-less environment. This is simple django views and if you access this through browser you'll see the counter value will be incremented every time you refresh the browser. If you're just coming from PHP this new fact should be more a warning than a cool new thing you want to try doing since most of the time you want to avoid storing state like this and make sure you always start with a fresh data on each requests. 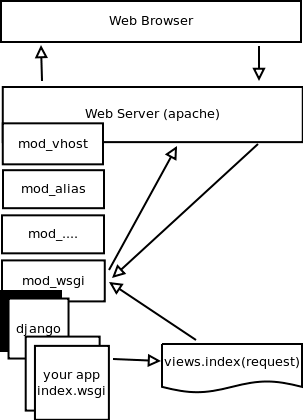 If you really need to store data that persist between requests such remembering user already login, there's better way such as django session object. Another important consequences from this new fact about python execution model is that it mean when we change our code, we have to restart the server so that it will have the latest copy of our code. PHP programmers might found this daunting at first but if you already work in application server model like Java you'll know that this is rather typical because when the server is start, it already load our code into memory, waiting to call some function when request came in. 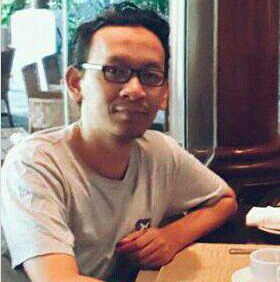 PHP due to it's CGI-like manner is different because the whole code only executed as part of the request. Executing whole application code on each requests work best with PHP because it's already been designed from the ground up as web language. The standard library functions in PHP also been written in C so it's already fast and executing that on each requests doesn't matter much. Python however has most of it's standard library written in Python itself which mean executing that on each request would be too slow. You'll also facing the same problem in PHP once your code base grow to certain level where you need to look for solution that cache the opcode such as APC or eAccelerator. Definitely there are more to discuss on the differences between PHP and Python execution model for web application but I hope this post can start giving you an idea why developing in Python a bit different than what you already accustomed to in PHP. I'll try to expand this topic more in upcoming posts and also welcome any suggestion to help PHP developers to keep up fast in Python web development. Related reading that help me a lot in understanding the difference between PHP and Python web execution model is a blog post by Ian Bicking few years ago - What PHP Deployment Gets Right.